It’s hard to gauge how popular Apple’s iCloud really is, but the idea behind it is solid: give developers a place to save their users’ data, give users control over this data and allow developers to focus on their apps and not storage. 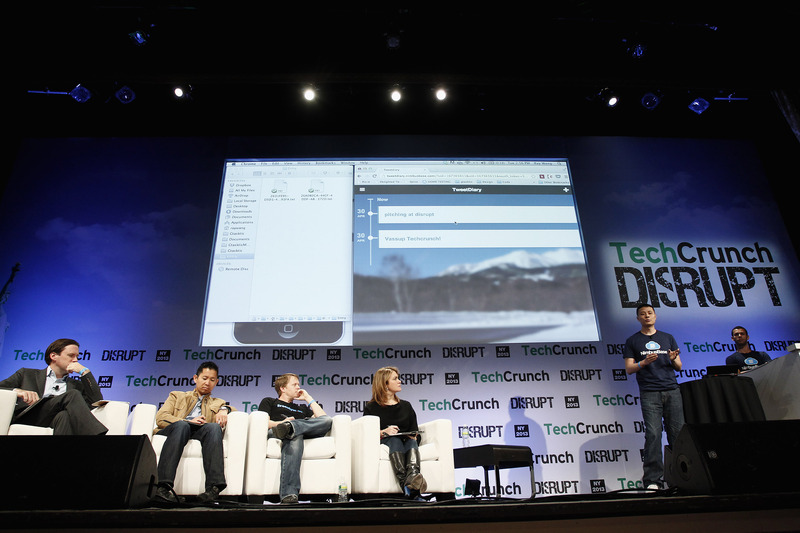 NimbusBase, which is launching at TechCrunch Disrupt NY 2013 today, had built exactly that, with the ingenious twist that the data is stored in the cloud of the users’ choosing. 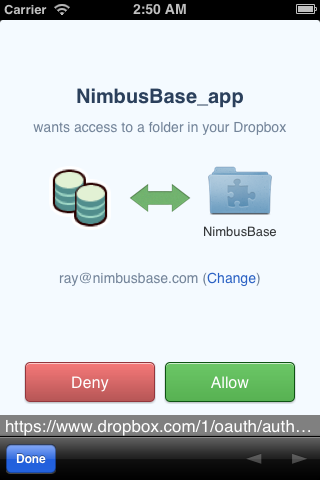 Currently, NimbusBase supports Dropbox and Google Drive, with SkyDrive and other providers expected to launch in the near future. NimbusBase’s New York-based founders Ray Wang (CTO) and Alex Volodarsky (COO) told me that developers currently have three choices. They can use iCloud, but that’s limited to iOS; they can build their own storage infrastructure and then pay for server space; or they can use specialized backend services, but those tend to charge a premium for storage. With NimbusBase, developers can easily integrate the same features they would get from those tools into their own apps, but without any of the hassle because the cloud storage providers handle all of the storage infrastructure for developers and users. To get started, developers only need to add a few lines of code to their apps and NimbusBase handles the rest. For now, NimbusBase only works for web apps, but the team plans to release its Android and iOS integrations soon. Services like Dropbox, of course, aren’t designed to be storage backends for apps, which typically use databases to store their users’ data. NimbusBase gets around this by first storing the data in a local SQLite database (or in a local file) and then slicing the data up into small files that get synced with the user’s storage service. In addition to storage, these cloud storage providers also function as the de-facto user accounts for the apps – just sign in with your DropBox or SkyDrive account – so developers don’t have to worry about that, either. For users, this also means they remain in full control over their data. Don’t like the app anymore? Just wipe out the directory in your Dropbox account and you’re done. You can try NimbusBase’s demo app to see how this works in practice. To make sure that Dropbox and Google wouldn’t have any issues with how NimbusBase uses their services, the team talked to both of these companies to explain its service and got the go-ahead from both of them. Currently, NimbusBase offers a free plan – its so-called “Hacker Plan” – which developers can use to build and test their apps. Once they are ready to launch their service, they will have to pay $500/year for the enterprise plan. For a popular app, the team told me, that should be a “no-brainer,” given that they simply pay a flat fee whether the app has a thousand or a million users, or whether those users save a few text files or high-res photos. 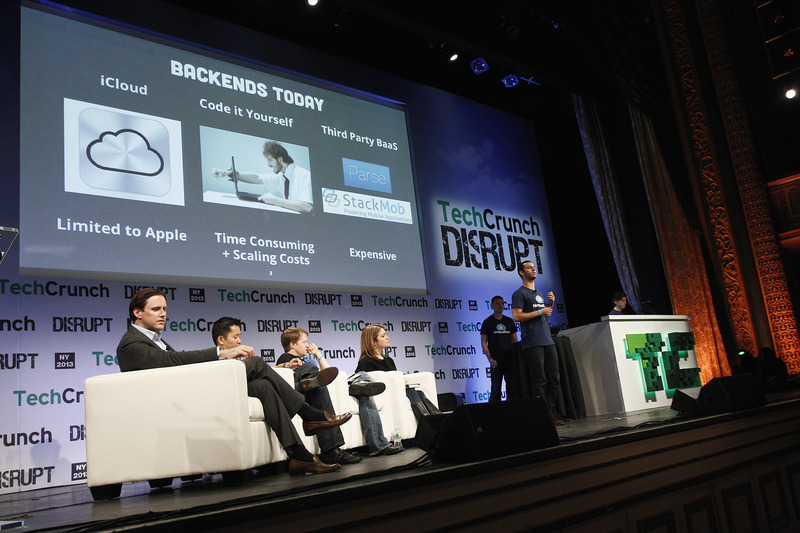 The users, of course, will have to start paying their cloud storage providers at some point. NimbusBase only works for web apps. Next on the company’s roadmap is an Android version that then allows Android developers to essentially replicate iCloud’s data-syncing features on Google’s platform. The team is also looking at adding encryption to NimbusBase’s feature set. So far, Wang and Volodarsky have bootstrapped their company, which they founded last August. The two are actively looking for additional funding to hire more engineers and to expand NimbusBase beyond Drive and Dropbox. A: Free at first, then an annual subscription price. Q: Where does this go in a year from now? A: Initially, will focus on mobile developers and start supporting more platforms. Q: How hard is this to do? A: “We think it’s hard because for people who want to integrated with every cloud providers, this is hard to do.” Syncing with personal clouds is not trivial. Q: Can you give me a sense of the scope of this problem? A: Building the infrastructure is hard for developers and users want control over their data. Q: What’s your sales strategy? A: Developer tools are viral. Once developers use it, they will tell each other and will reach out to others.